Random House Trade Paperbacks, 9780812968279, 336pp. How does our government eavesdrop? Whom do they eavesdrop on? And is the interception of communication an effective means of predicting and preventing future attacks? These are some of the questions at the heart of Patrick Radden Keefe’s brilliant new book, Chatter. In the late 1990s, when Keefe was a graduate student in England, he heard stories about an eavesdropping network led by the United States that spanned the planet. The system, known as Echelon, allowed America and its allies to intercept the private phone calls and e-mails of civilians and governments around the world. Taking the mystery of Echelon as his point of departure, Keefe explores the nature and context of communications interception, drawing together fascinating strands of history, fresh investigative reporting, and riveting, eye-opening anecdotes. The result is a bold and distinctive book, part detective story, part travel-writing, part essay on paranoia and secrecy in a digital age. Chatter starts out at Menwith Hill, a secret eavesdropping station covered in mysterious, gargantuan golf balls, in England’s Yorkshire moors. From there, the narrative moves quickly to another American spy station hidden in the Australian outback; from the intelligence bureaucracy in Washington to the European Parliament in Brussels; from an abandoned National Security Agency base in the mountains of North Carolina to the remote Indian Ocean island of Diego Garcia. As Keefe chases down the truth of contemporary surveillance by intelligence agencies, he unearths reams of little-known information and introduces us to a rogue’s gallery of unforgettable characters. We meet a former British eavesdropper who now listens in on the United States Air Force for sport; an intelligence translator who risked prison to reveal an American operation to spy on the United Nations Security Council; a former member of the Senate committee on intelligence who says that oversight is so bad, a lot of senators only sit on the committee for the travel. 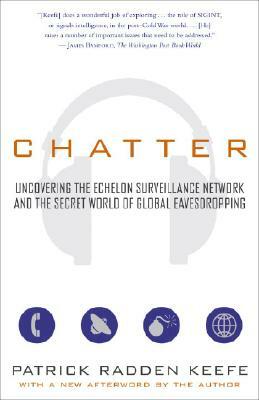 Provocative, often funny, and alarming without being alarmist, Chatter is a journey through a bizarre and shadowy world with vast implications for our security as well as our privacy. It is also the debut of a major new voice in nonfiction. PATRICK RADDEN KEEFE was a Marshall Scholar and a 2003 fellow at the Dorothy and Lewis B. Cullman Center for Scholars and Writers at the New York Public Library. A third-year student at Yale Law School, he has written for The New York Review of Books, The Yale Journal of International Law, Legal Affairs, and Slate. This is his first book.